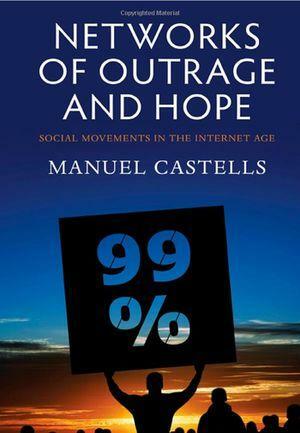 The cover of Manuel Castells’ most recent book, Networks of Outrage and Hope. Please note: these are rough, incomplete, live notes, not a full transcript or a polished post. There are omissions and errors. If you find them, please feel free to leave a comment or edit this post directly, here: http://brownbag.me:9001/p/castells-gsd-2014. Thank you! Castells begins by thanking the department of urban planning and design, and the GSD. He especially thanks Diane Davis, and her interest in the links between space and design. Diane was a student of his, and they shared fieldwork in Mexico. He notes that Mexico is a key country, in a terrible urban and political situation. He feels it’s a moment when scholars linked to Mexico should work more to support Mexican colleagues. He says that tonight’s lecture will focus on urban social movements; he’ll also talk about the impllications of urban social movements on the theory of space, and spatial forms and practices. Castells starts out by noting that throughout history, social movements have been major agents of social change; he would say THE major agent of social change. Social movements are triggered by emotions that are shared collectively; individuals share emotions through communication and become shared subjects. Social change, according to Manuel, is inseparable from spatial change. He contends that all urban forms result from the relentless interaction between the reproduction of urban forms by institutions and resistance, or counteraction, by citizens who don’t feel included in the processes of automatic reproduction of the existing urban structure. Urban form results from urban structure and social movements interacting with one another. In this lecture, he’ll be talking about networked social movements. He holds that they are the key form of movement in the networked society. Next, he’ll hypothesize the interaction between these kinds of movements and urban spatial processes. Next, Castells summarizes recent social movement history. Starting in Iran in July 2009, then Iceland and Tunisia in 2010, a wave of social movements has taken place around the world. He says that this wave was not expected by anyone, not led by anyone, was largely spontaneous, and affected literally thousands of cities in over 100 countries. Most of these movements were small, and escaped the attention of the media. Still, they mobilized hundreds of thousands of people, and achieved widespread social support, as indicated by opinion polls and surveys. He finds it interesting that many of these movements display similar characteristics despite the huge diversity of contexts from which they come. He feels that we are witnessing the birth of a new form of social movement, characteristic of our type of society. His argument, he states, is based on his own observations, the observations of other scholars, and information he gathers from a network of scholars, friends, and movement acctors who work in the different locations. Castells mentions that in Mexico, #YoSoy 132 continues, if subterranean. The Turkish protests, around Gezi Square, continue to be active and have provoked a political crisis. He also notes “And by the way, they won: the Gezi Park development was cancelled.” In Brazil, the movement around transportation broadened to address corruption, and even corruption within FIFA. “We change one hospital for 10 stadiums” was the slogan. He asks us “Can you imagine Brazilians protesting against Soccer?” In the Ukraine, Manuel notes that social movements are redefining the relationship between Eastern Europe and the EU. Of course, these movements have had very different demands, and contexts. Brazil and Turkey, he notes, have no economic crisis. In Both, Brazil particularly, there were strong antipoverty programs by the State. In Brazil, the left is in political power. Turkey also is far from crisis, in fact doing fairly well economically. Castells wants to emphasize that the theoretical back.ground is communication power, his book of 2009. He’s interested in exploring which common trends repeat across all the movements, and reveal the patterns of a new form of social movements. He argues that some of the shared characteristics are: these movements are networked, multimodal, both global and local, viral, leaderless, self reflective, non violent. First, he says, these movements are networked around the net and mobile communication. In 1991, the first survey of cell phones in the world, in terms of subscribers, was 16 million people. Now, it’s 7 Billion people, in a planet of 7.4 Billion. The most recent projection is 5 Billion smart phones in 5 years. So the number of internet users will skyrocket through smart phones, providing the tech and social platform for this kind of networking. He notes that communication has always been central to social movements. Pamphlets, speeches at the church or mosque, TV, radio. Rumors, as a matter of fact. Without communication there’s no social movements. And each movement uses the tools available. So today, networked movements have powerful effects of rapid diffusion, most importantly, communicative autonomy. Even if corporations control the platforms, movements have greatly increased autonomy in communication vis a vis the state, the media, and other instuttutions. Next, according to Castells, these networks exist offline and online. For example, in the Egyptian revolution, the offline networks of soccer fans were absoutely essetnial. Personal, family, and religious networks are key. All of these different networks are connected via the net and mobile communication. So it’s networks of networks that form the new social movements. He emphasizes that there is no identifiable center to networked movements; they can connect, reconnect, and form themselves. They can relatively easily escape repression: even if you round up the usual suspects, you can’t eliminate the network, which doesn’t necessarily have a formal leadership. Castells feels that the network form reduces the possibility of repression, and also protects the network against itself. Against bureacratization. If anyone becomes too heavily ideological, the network can disconnect and move on. He also notes: the movements become movements by occupying urban space. That is the critical moment, in which the networks go from outrage to hope. In public space, they can begin deliberating and debating. They can symbolically lay claim to the city. Symbolic squares, avenues. They are simultaneously tactical and symbolic: if you block the main square or street, the city grinds to a halt. But they are urban social movements that demand recogniztion in public space. The space of autonomy, a hybrid, not virtual or physical space alone, is the space of these movements. Castells notes that these movements connect online, but also send people to do revolutionary tourism – “the nicest kind of tourism I know.” So people do connect face to face; in fact, Castells jokes, some of the movement tourists are policemen [ 🙂 ]. The movements also name their spaces in connection: In NY Liberty Park was partly renamed Puerto del Sol, and part was renamed Tahrir. In Plaza Catalunya, they renamed it Tahrir. So they identify with one another in a struggle against repressive institutions that they don’t recognize as their own. Castells argues that these movements are spontaneous. Most come from a spark of indignation. An image becomes unbearable: an image of violence, another corruption. In Brazil, September 2013, the movement that began in June was reignited by the news that a member of parliament who had been sentenced for embezzlement claimed the right to be a parliamentarian and receive his salary, and Brazilian congress voted for it. So, facts that can’t be tolerated anymore. Fed Up! Basta! Indignation pushes a call to action, from the spatial flows, to create an instant community of revolt in the space of places. He believes that many people are talking about Twitter, but that YouTube has been decisive, because the images of brutality, violence, and assassinations ignite revolt. Including in democratic California, where UC police used pepper spray on peaceful students sitting in the campus. It’s not only the machine guns of Assad, it’s also the police of California or NYC, who feel the right to do whatever they want. Karine Nahon, in her recent book Going Viral (http://www.amazon.com/Going-Viral-Karine-Nahon/dp/0745671292) describes the constant process of virality in networked communication. In the movement context, anything you start in one place has the possibility of emerging in other locations. “Tunisia is the Solution” was a slogan across the Arab uprisings. The old slogan was “Islam is the solution.” In Syria people rose up saying “We’ll do it like in Egypt.” In Bahrain, the same: replicating. Castells emphasizes that the idea is, we’re not alone in the world. These movements are organized by anyone, they achieve Virality through the connection of the minds. Castells notes that in general, this is a common characteristic of the current wave of movements, although it’s not always the case. In Chile, the student mobilizations have leaders who are mostly communist students. But in general, if there are leaders, they accept that the movement, not the party, is the leader. Because otherwise, he claims, “they’d stop being leaders in 10 minutes.” Many people try to be leaders, as is human. But it’s in the DNA of the movements, to reject the delegation of power. They don’t reject democracy, or even representative democracy. They say “as soon as we delegate, they’ll do whatever they like!” Primitive anarchy? Maybe. But Castells says he isn’t trying to propose the way forward, he’s just describing what he observes. Castells notes that these movements endlessly debate: who we are, what we want, why. He’s seen heated debates, in general assemblies, about Heidegger. Of course, many in the mobilizations are indeed college educated and unemployed. The point is, they don’t start with an ideological position, they are self reflective and open to debate and transformation. Castells emphasizes that in their origin, this wave of movements is non violent. But systematically, they’re confronted by violent repression. It can be tanks, guns, or batons and gas, but for sure, repression comes. The life of the movement is determined by how it responds to violence, because the movement needs the support of the 99%. In most cases, these movements do have the support of the majority, he notes, according to opinion polls in each country. However, some do respond with violence. Castells singles out in particular the Black Bloc, which is, according to him, “a Black Box.” Castells claimes it’s composed of young violent anarchists, thugs, police infiltrators, and other elements. He feels that the moment fire, blood, runs in the streets, the movement is cornered: it loses the support of the broader public. Of course, in the Arab revolutions, he notes it’s worse. In Syria, for 6 months, the movement didn’t respond with violence, even in the face of heavy repression. Thousands (6,000? 10,000?) people were killed during nonviolent protest. [Note: see this article “Whither the Peaceful Movement in Syria?” on Jadaliyya for more background on this: http://www.jadaliyya.com/pages/index/10616/whither-the-peaceful-movement-in-syria]. The moment guns, provided conveniently (by US, Saudi Arabia and Quatar) appeared, the movement transformed to a civil war. Castells notes that the first victim of civil war is social movements. The movement becomes a revolution, aimed at seizing control of the state. In the case of the networked movements, however, he contends their demands aren’t channeled towards the institutions of the state. They practice deliberative democracy. He argues that there is a move towards a new utopia of networked democracy. Castells states that “Utopias are not fantasies. All major political projects in the world began as utopias.” Liberalism, Socialism, Communism, anarchy, grassroots cooperativism, were all utopias. Utopias can’t direclty become constitutions, fouding documents for a nation state, but they are the materials we use to live together. Castells describes the myopia of certain strands of social movement analysis. He says that the movements themselves say “your outcome measures are a short term vision of social change.” The Spanish movement had a slogan, “We are slow because we go far.” If you’re productivistic, the question is the time frame: are you going to be productive in 1 month, 5 months, 2 years? The movements don’t have a deadline for liberation. Castells maintains that the fundamental battle is in the minds of people, not in the corridors of power. In EU, there’s a crisis of legitimacy, as in the USA. There’s a huge gap between what people believe democracy looks like, and the actual practices. All the empirical data reveals this gap. So, movements can raise hope beyond the existing political institutions. Castells shares a story: He was in London when the Iranian movement was crushed. A journalist was telling him “see, it’s over.” But Castells replied that these youth weren’t trying to defeat the Revolutionary Guard, they didn’t plan to win in the immediate future. 60% of college graduates in Iran are women. The country has 1 million bloggers. Mobile communication is pervasive. They were the ones doing this movement that was “crushed, but not crushed.” Surprise: Rohani was elected, supported by these people exactly. Rohani, says Castells, is not revolutionary, but he is like Khatami. He can relate to the demands of the movement to some degree. In other words, based on the movement that was “crushed,” we have a modernist reformer Iranian president, without a mass bloodbath. In Turkey, he notes, a tremendously corrupt and authoritarian government has been exposed, 2 ministers have been imprisoned, and the political system has been shaken. In Italy, the 5 Stars party has made an impact in the election, their program: direct democracy over the internet. Castells argues that the current wave of networked movements think that all political elites are corrupt. But still, things move. In Greece [x] is the main party, all the other parties band together against them. In Italy, Berlusconi was ousted, although it’s complex. Brazil is the most interesting case. Dilma Rousseff (http://en.wikipedia.org/wiki/Dilma_Rousseff) said publicly: ‘they are right.’ Castells also feels that Brazil stands out in terms of the corruption and non-representativeness of the political class. Dilma is writing a new electoral law, and putting it to a referendum. Another move is developing a net free from the control of the NSA. These were all demands directly from the movements. Finally, Castells apologies for a short detour into theory. He wants to talk about the spatial dimensions of networked social movements. He begins by noting that the housing crisis was the result of financial speculation, the massive high risk use of mortgages as collaterals for other investment. When the real estate market collapsed […gap…] many of the movements have taken place as a result of the massive foreclosures. In Spain this was a key issue. In other cases, there’s been a challenge of the model of growth. In Brazil, Turkey, and Israel, the movements say: “we want development, but not this development.” Castells is arguing that the movements must be seen as a direct and explicit critique of the model of top down urban development. Castells notes that fundamentally, occupation of the streets is a key aspect of the current cycle of movements. The old model of the barricades isn’t a military tactic, he points out. “They attack you wherever you put the barricade.” It was a model of “In and Out.” Building a community within the barricades, as an opposition to the formal institutions that are themselves exclusionary. It’s also retaking of urban space, creating instant public space, which is the key issue in the speculative processes of urban development. He wants to connect these processes to the theory he formulated in 1996: the space of places and the space of flows. In Urbanism 101, Castells notes that the question is: “what is space? Easy, right? You go crazy. Because space doesn’t exist outside of us. Space in nature is not our space. Space in human terms is a dimension of human existence.” Castells argues that space has to be defined in terms of social practices. So, he developed a material theory of space. “I went crazy myself” thinking about what space is, he says. He argues that throughout history, simultaneity depended on contiguity. In other words, cities were the main space for simultaneity. Then came the telegraph: distance communication. A new space emerged, in which simultaneity, or chosen time, would not depend on contiguity, but connectedness. So Castells’ point was, there’s a space of places, where simultaneity is based on contiguity, and a space of flows, where simultaneity is based on communication. Originally, Castells thought the space of places was the location of experience, and the space of flows was the space of power. He thought this because in the 1990s, corporate, financial, and military communication networks were really the spaces of power. In the space of experience, people were holding out. His point was: power was run from the space of flows. People lived in the space of places, but their lives were determined by what happened in the space of flows. He asks the audience “Right?” People nod. He says “wrong!” Laughter. Castells observed that humans started to use the space of flows for their own purposes. For sociality, friendship, family, relationships; social movements, and so on. At the same time, the space of flows began colonizing the space of places. So, he says, it turns out there is power and counterpower in both forms of space. He ends: “To enact social change, any actor has to counteract the power in the space of places with counterpower.” They must construct autonomous structures and counterpower in both the space of places and in the space of flows. First question: Compare Occupy to Kent State? Question: Is not it an optimistic analysis? Turkey’s Internet Law which bring limitations to the Internet was approved by the President today. Should we see the worse before seeing any better? What about the electoral politics? According to a survey, even though 70 % of people believe the corruptions are being made, still 40 % of them will vote to AKP. Answer: Erdogan targeted Twitter at the Gezi events, too. In fact, no one can ever stop the Internet. It is like electricity. He can not cut electricity. The movement is in people’s minds. It is too late to remove these from people. Erdogan already lost the support of intellectuals and urban middle class who initially had supported him in reducing military. Ground is shaken. Nothing will be the same again. The future will be young. Question: What about the negative side of the Internet? Answer: I am not approaching normatively. In fact, there were some neo-nazi elements in Ukranian movements. Populist right networking can be also part of these movements. They are also after changing the values of the society. Question: How did the Occupy happen in individualistic America? Answer: We should not see cultures as individualistic versus communitarian. We now talk about networked individualism. I can connect with more urban collectives as an individual.